Mango Nutrition Facts: Super Fruit, Tropical Delight! A mango is a super fruit! Lets discuss the nutrition facts of this succulent sweet tropical delight. A mango is one way to experience that tropical feeling without ever leaving your kitchen. Mangoes are high in Vitamin C, Vitamin B6, Potassium, Copper and Vitamin A.
Mangoes also contain several important phytochemicals including: Cryptoxanthin, Lutein, Gallic Acid and Anacardic acid. Read more about phytochemicals here. Last Word: Mangoes are an incredibly healthy snack. You can eat the entire fruit for just over a hundred calories. High in fiber, virtually fat-free, and mangoes contain numerous vitamins. 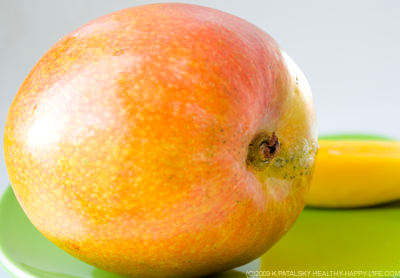 It is easy to see why tropical mangoes are considered a super fruit. Mangoes also contain beta-carotene which may help slow the aging process, reduce the risk of certain forms of cancer, improve lung function, and reduce complications associated with diabetes. Moangoes are indigenous to India, Pakistan, Bangladesh, and Southeast Asia. In 2007, the most mangoes were grown in India, followed by China and Thailand. It's wonderful when a fruit that tastes so delicious has so many wonderful nutrients in it. Later this week I'll be posting a delicious mango recipe-so be sure and check back for that!